Chief rabbi of Ukraine wants Holocaust program moved to his country to punish Poland. A chief rabbi of Ukraine called on the Israeli government to suspend school trips to Poland and have them in his country because of Warsaw’s new bill on Nazi crimes. Rabbi Moshe Azman made the suggestion in a letter he sent to Education Minister Naftali Bennett (Jewish Home) on Thursday, a day after the Polish Senate passed a measure that proposes to outlaw rhetoric in which Poland is blamed for Nazi crimes. The State of Israel and many Jewish organizations, including the Simon Wiesenthal Center, Yad Vashem and the European Jewish Congress, say the legislation risks blurring historical truth, as many Poles participated as individuals or as members of some resistance militias in murdering Jews or betraying them to the Nazi occupation forces. They also acknowledge that Polish authorities were not part of the Nazi campaign of annihilation against the Jews during the Holocaust. 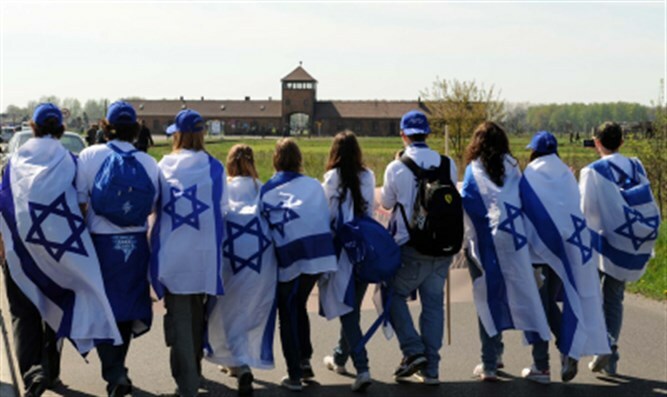 Following the bill in Poland to “forbid telling the truth on what happened during the Holocaust in Poland,” Azman wrote, “I urge you to cancel the March of the Living for Israeli school students.” The march brings individuals from around the world to Poland and Israel to study the history of the Holocaust. In 2015, Ukrainian President Petro Poroshenko signed a law honoring Ukrainian independence fighters, including militiamen complicit in the murder of tens of thousands of Jews. Another law signed by him makes it illegal to “insult” or “question the legitimacy” of these fighters. As the “chief rabbi of Ukraine, I propose having the March of the Living this year in Ukraine,” added Azman, who also wrote that the move he is proposing would amount to “imposing a fine on Poland” to the tune of tens of millions of dollars that Israeli participants of the March of the Living spend in Poland. Unlike in Poland, the Nazi occupation forces in Ukraine drafted thousands of local volunteers to actively assist in the murder of almost a million Jews in what is today Ukraine. The Nazis allowed the establishment of a Ukrainian SS division, the 1st Galician. The OUN resistance group to Russia fought for a time in coordination with the Germans, who did not allow Poles to possess arms. The OUN and UPA were also implicated in the murder of thousands of non-Jewish ethnic Poles, who were not Jewish. In its annual report on anti-Semitism, Israel’s Ministry for Diaspora Affairs said that the number of recorded anti-Semitic attacks documented in Ukraine in 2017 surpassed the tally of all such incidents in the entire former Soviet Union. More than 130 incidents were recorded in Ukraine last year, the ministry told JTA, double the total for 2016.